The past month has been a month of goodbyes for me, a month of gratitude and love and letting go, as I leave the congregation that was my first real church home, and the congregation that helped me hear my call to ministry. As I finish up my goodbyes, I find myself in an interesting liminal space, uprooted from the congregation that has created so much of the rhythm of my life for the past 15 years, not yet planted in the congregation that will be a big part of my life beginning at the end of August. Seems like a good time to ask, “Who am I?” I attended my 30th college reunion last weekend to help me ponder the question from another angle, adding good dose of “Who was I?” to the investigation. I have had moments – and I expect there will be more – where I feel existentially dizzy. Moments of wild optimism about all the possibility ahead of me, and moments of fear that I will squander the opportunities and collapse into my smallest self. 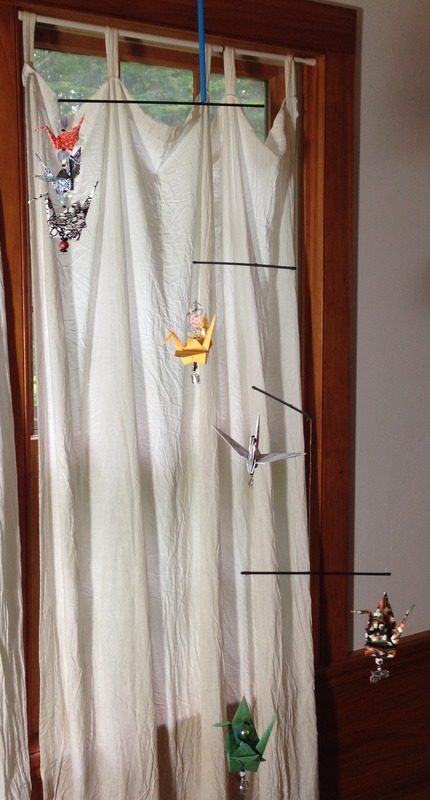 One of the themes that has run through my relationship with my teaching pastor from the very beginning is balance, and so as an expression of my gratitude for all the time and energy he has put into supporting me in my ministerial formation, I made him a mobile of peace cranes. If you haven’t made a mobile lately, I highly recommend it as a spiritual exercise. It was ostensibly about him maintaining balance in his life – three cranes of graduated size, representing him and his boys, hold one side of the top bar of the mobile, balanced against cranes representing (roughly) work, play, music, and connection to the earth. But the time I spent on the project – choosing the papers, folding each crane with a prayer, finding beads to make the symbolism of each crane more visible, and finally stringing them all and finding how to get them to balance against one another – that was all pure gravy for me. It gave me a very physical metaphor to play with the idea of balance in my own life, too. I had the pieces of the project with me at reunion, because I knew there would be people who could help me figure out the physics of making it work – but it pretty much stayed in the box, and I figured it out later the old-fashioned way, by trial and error. And yet it was good to have it there, reminding me to find a place of balance between who I once was and who I am becoming, and reminding me that as new things are added or old things taken away, the balancing point moves. The trials are important, and the errors provide useful information on the path to success. Also, balance is never a static thing. There is a deep satisfaction in finding that place where things do balance, and it is always a dance as the air flows and the things move. It seems to me that one of the gifts of growing older is the lifetime of experience that tells me that even though, right now, I feel like things are fluctuating rather wildly, I will find a new balancing point in time. I can be truly grateful for this state of flux and the opportunity to test new ideas, new ways of being. And once in a while, if I am getting too dizzy, it’s okay to plunk down and watch an episode of “Orange is the New Black” or catch up on the latest internet memes. Balance, people. It’s all about finding balance. That, and being love.